Not every holiday party is the same, especially when it comes to using custom ribbons! Start your holiday party off right with personalized ribbons. From ribbon rolls to rosettes, not only do we have the right ribbon for you, but we also know the best ways to use them. Decorations, wrapping presents and party games are just a few quick ideas, and here are some more! First is the most obvious use: wrapping presents. By adding names, dates or festive messages to a ribbon roll, you can create truly unique gift wrapping. Let someone special know just how you feel with a brightly colored ribbon wrapped around the perfect gift. Or, tie a bow around their favorite spirit or hard to wrap present. Ribbon rolls can go a long way. Use them to brighten up your Christmas tree with ribbon streamers or hanging each ornament with ribbons instead of paper clips. Or, make a festive and holiday party door wreath. These ribbons are perfect for decorating a holiday party table too! Badge Ribbons are Great for Nearly Anything! 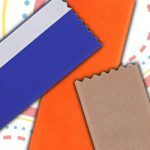 From badge ribbons to custom top ribbons, these flat fabric pieces are great for any party need. Use them as unique gift tags for presents and door prizes. Or, use a custom top ribbon for a different ornament look on your holiday tree. Blank badge ribbons are also quite useful for dinner parties. Ideas for using them include labeling the buffet table and providing seating assignments for each guest. Choose holiday party colors or theme them to fit your party needs. Whether your holiday party has games or fun contests, everyone loves a great award. And, that’s where rosette ribbons come in handy. Award someone for the ugliest holiday sweater. Or, use a rosette as a first, second and third place prize for a game of holiday trivia. 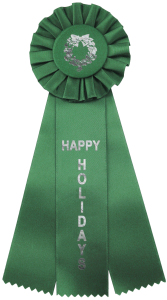 These custom ribbon awards are perfect for any holiday get-together. Another unique idea is to use the rosette as a game piece. Or attach them to a present or door prize. But, no matter where you use them, these rosettes are sure to be the hit of your holiday party. So, from decorations to prizes, find your perfect custom ribbon for your holiday party this season! How Do You Use Your Ribbons? From holiday DIYs to corporate events, ribbons are perfect for almost any need. But, we want to know more! What do you do with your ribbons? Are there any particular ways you use a ribbon? From ribbon rolls to rosettes, every ribbon is essential in decorating, gifting and so much more. Here are our top nine ways to use ribbons. No event is complete without ribbons! And events such as weddings and other parties prove that. From decorating tables to providing accessories for attendees, every event can find a use for ribbons. Use badge ribbons to identify your attendees. Or, use ribbon rolls so that everyone can show support for their cause or an awareness of a disease or issue. Rosette ribbons are perfect for fairs and festivals. Give them out as awards and prizes. Or, use ribbon rolls to brand baked or homemade goods at a fair. 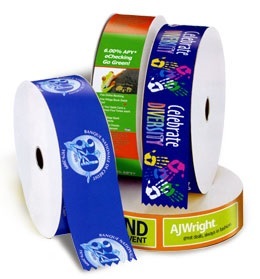 A badge ribbon is a unique way to advertise a company or specific booth that needs help with marketing their product or service. And, there are no limits with ribbon use at a convention! From identification to icebreakers and everything in between, find a ribbon to suit all of your needs. With Christmas and other holidays just around the corner, ribbons are sure to be seen everywhere. They will be poking out from under holiday trees wrapped around presents to make sure the receiver knows just who their gifts are from. 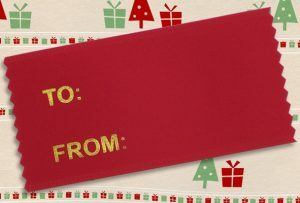 Use a badge ribbon to make a unique gift tag. And, ribbons are frequently seen in stores as businesses prepare for holiday sales. 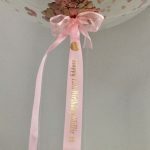 Custom top ribbons are a perfect example. Take advantage of the full-color printing and create sales reminders and unique coupons for your business today. Or, place them around the store for hidden sale items and raffles. Don’t forget the holiday decorations! 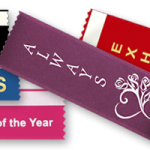 From your home to any business, a custom ribbon is the perfect answer to any decorating need. Use them on door wreaths, festive garlands and so much more! No craft or hobby is complete without a ribbon. Take long ribbon roll pieces and make garlands to hang on your wall or a beam on the ceiling. Or, wrap ribbon around flower bouquets and centerpieces to make them fit any home or store decor. 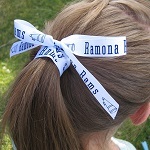 And, with so many options to choose from, pick a custom ribbon to match any color theme. Do you have extra ribbon scraps left over from your last event or celebration? Make ribbon flowers and attach them to handmade bracelets, headbands, purses, shoelaces and almost any other accessory. Everything always looks so much better with ribbon! We’re still interested in hearing from YOU! So, how do you use your ribbons? 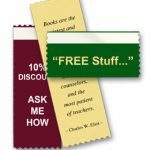 From titles to information and sales, badge ribbons are more useful than you might think. It is no secret that badge ribbons are one of the most common ribbons available. But did you know that they have multiple uses? Yes, they have titles imprinted on them, but those titles don’t always have to be staff, president or secretary. Customize one of these flat ribbons to meet any need! And, to get the ideas rolling, here are 18 ways to use these ribbons. 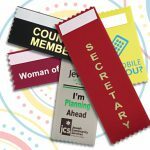 From titles to logos, badge ribbons are perfect for using at an office or during a conference. They help to identify staff and attendees in a manner that a name tag may not fully accomplish. Use stock titles to help identify each attendee, or create your own with custom titles. And add a logo to custom graphic badge ribbons to help promote your brand! Custom graphic badge ribbons are the perfect tool for proudly displaying your company’s growth and sales increases. Include any other statistical information you want on these promotional tools. And, use them to promote your company events and sales. No matter the event you are planning, badge ribbons are the perfect accessory. From simple decorations and place settings to helping to organize event staff, these identification tools are there to help. Use colorful badge ribbons to label the buffet, or use them to coordinate different aspects of the event. Badge ribbons are perfect for labeling party favors and go great as gift tags. Or, try using them during games and party icebreakers. These ribbons are perfect for getting to know each other during your party. Use them for names or to identify individuals using different colors. 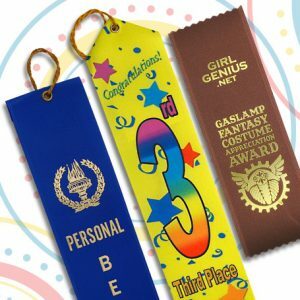 Give everyone a reminder of your party with a unique bookmark or souvenir imprinted with party information on the ribbon. Show support for your cause or another charity with specific colors, like pink for a cancer event. Or, use these tools as placement awards for any games or contests going on during your event. Each winner will want to wear their award with pride while they enjoy the rest of your event. Raffles can be one of the highlights at any big event. Add a fun twist by having people write their names on blank ribbons instead of using paper raffle tickets. Even use blank ribbons to label the raffle prizes. But, no matter how you use badge ribbons, they are great for everything at any event, party or other function. Whether it’s a birthday party or wedding, no event is complete without balloons! From simple accents to more elaborate centerpieces, custom ribbons and balloons are perfect for a personalized look. And, with tons of ribbon roll colors to choose from, we have something for everyone. 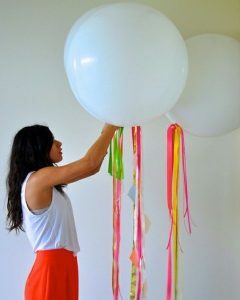 Here are some creative ideas to get you started with decorating using your ribbons and balloons! Use fun, bright ribbons to secure balloons to a table or other decorative spot. Run a ribbon from the base of each balloon to the table and secure it with a piece of tape or by tying it around a balloon weight. These ribbons should complement or match the balloons so as not to detract from the rest of the decorations. Use multiple strands per balloon for added fun. Or tie pretty bows to the base of each balloon. 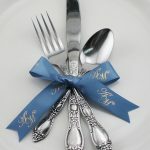 If you are hosting a wedding, add unique details to each custom ribbon such as names, dates and other bride and groom favorites. And, for birthday parties, use the recipient’s favorite colors to add accents to each balloon. But no matter what your event is, get creative in how you customize the ribbon rolls. 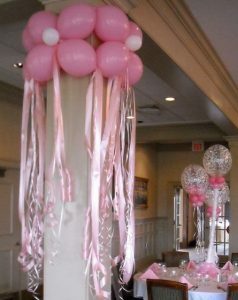 Try draping sheer fabric over the top of the balloon and secure it to the base of the balloons with personalized ribbon. Or, wrap each balloon with a festive and personalized message. Need an elegant look? Layer two different ribbon types like organza and single face satin to make your colors and message pop. Decorations can include a color theme. This is where the planning gets really fun! 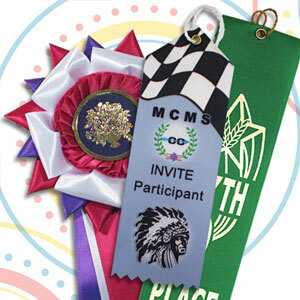 Order custom ribbon rolls in the theme colors and add text that indicates what your event is. Ribbon rolls can be used to make unique wall decorations by hanging ribbons from balloons to create a curtain effect. Or use this idea to accent a doorway or entrance to the party. No matter how you use them, balloons are always a fun accessory for any party! And, now make them even more creative with personalized ribbon rolls.